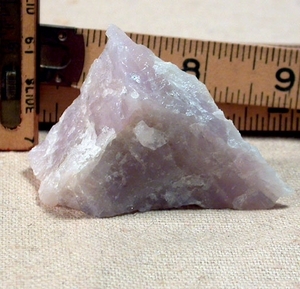 California gem grade miniature of very rare, juicy colored lavender rough in a tabular triangle of 1-1/4"x 2-1/2"x 1-3/4" high presents many possibilities: your cabinet of miniatures, your selection of rare specimens, your attraction to purple, your gem-cutting skills, your meditation work. Rainbows, a touch of chatoyance, and a side of thin milk quartz rills captivate. Note the mine has been closed since 1997.